If you are the kind of person who can’t laze around on a holiday and need to pack in some adventure, Banting’s Tadom Base is just for you. Touted to be one of Malaysia’s toughest obstacle courses, Tadom Base offers different levels of terrains for different visitors to allow you to choose the experience you want. Tadom Base covers ground that includes natural relief features such as rocks, limestone hills, lakes, and even a Zip Line that is sure to test your limits. 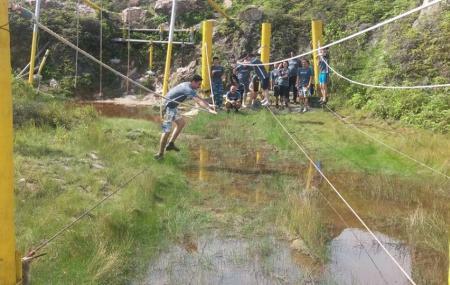 You can try out different terrains and cross the obstacles there depending on your preference. The team at Tadom Base makes sure you are secure and safe at all times. How popular is Tadom Base? People normally club together Jalan Sultan Abdul Aziz Shah and Putra Bridge while planning their visit to Tadom Base. Great for a short escape from busy town life. You can do activities such as riding the ATV, flying fox and swimming. Life jacket for swimming are available as the lake itself is quite deep. Huts are available if you want to stay for nights. Toilets are clean and well maintain.